At the close of the eighteenth century there were two distinct and greatly influential revolutions. The reverberations of the American fight for independence and the French Revolution are still being felt today. The extent of their influence is hardly appreciated by most and misunderstood by many. History books often extol how the first inspired the second. The truth is the only inspiration the first gave to the second is the belief that success was possible. In philosophy and objectives the two revolutions were almost complete opposites. 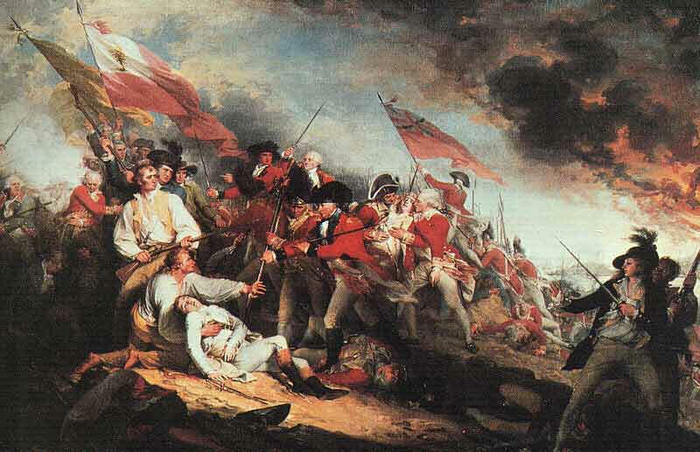 The American Revolution was a revolution by default. The American Colonist sought not some new world order, or to establish a new groundbreaking form of government. They simply wanted to keep what they had always had and saw as their God given right. The fact that they ended up creating the modern republic, and the prototype upon which much of the modern free world is based, was merely a side effect. They fought to remain free in the English tradition of what it meant to be free. Liberty to them was freedom to do and accomplish whatever you talent and drive allowed unhampered by government. The philosophy driving these mostly reluctant warriors of independence was called individualism. Individualism was born from the English (and going even further back Anglo-Saxon) tradition of equality before the law and the belief in a common code among men. Natural law and individual rights formed the basis of the English concept of ordered liberty. John Locke was the foremost advocate of this philosophy and his books some of the colonies most read. It was these ideas that fed the need to resist the encroachment on liberty that King George III saw fit to saddle on them. It was only after years of abuses, and even then with no small amount of soul searching, that the leaders decided to declare themselves no longer Englishmen. When the leaders of America signed the Declaration of Independence they risked not only their property and positions, but their very lives. They did so with not just themselves in mind, but it was fate of the entire country and countless future generations that was weighing heavy on their shoulders. The fact that all men should be equal before the law and have the right to life, liberty and to pursue happiness was a belief whose roots ran to their very core. The results of the American fight for independence was the birth of a new republic and a constitution unlike any that had came before. What was formed was a country that would become in the nineteenth century a beacon of freedom to the world. It was not mere coincidence that it was destined to lead the world economically also. The world at the end of the eighteenth century was one barely advanced beyond that of Columbus three hundred years earlier. By the beginning of the twentieth century, barely over a hundred years later, men went from coach to plane, sail to steam, letter to telephone, and musket to machine gun. In the same time frame the U.S. went from being a colonial backwater to strongest nation on earth producing nearly half the world’s goods. Those that followed the American model prospered also, freedom and trade were shown to be no panacea but the absolute cure for an impoverished world. Shortly after the American’s fought and won their revolution, the French Revolution rocked Europe to its core. The French had no tradition of liberty or sense of individual worth. The tradition woven into their history was one of absolute monarchies and a firm belief that the people’s welfare was the government’s responsibility. Theirs was a society that had been always built around the idea of a central caretaker. These were the ideas that spurred what its supporters now call the grand and glorious French Revolution. The leaders of the French Revolution rejected the ideas individual liberty and responsibility. To them individuals were products of society, cells of a societal body if you will. The John Locke of French anti-individualism was called Jean Jacque Rousseau. Rousseau saw the tribal societies of America as archetypical of how societies should function. Instead of religious freedom, he believed a belief system should be one shared by the populous as a whole and based on the ‘General Will’ of society. Property was also envisioned similarly to the way tribal societies saw it, with the resources that provided their members with protection, food, and shelter as inherently communal property. To the French Revolutionaries, modern societies should also act similar to tribal societies; as long as you were part of society you should be taken care of. The price demanded for this French idea of liberty was absolute conformity and loyalty to society. In this new way of thinking, true liberty was found in the safety and security of the state. The price for this French version of liberty was doing your duty and conforming to the greater society/ This meant doing whatever it demanded of you. The societal organism was preeminent and the individual a mere expendable part of it, a cell to be kept or shed according to the needs of society. Rousseau declared unequivocally, that if the state says to a man that it is “expedient for the State that you should die, he should die”. The state, for its part, was to act as the soul of society; taking care of it, nurturing it, and directing it according to its interpretation of society’s General Will. To the French revolutionary mind the kings of France had not only been derelict in their duties to care for society (an unforgivable sin in its own right) but had no legitimate claim to lead in the first place (never having been sanctioned by society). Blame for all the ills of society was placed on the aristocracy, and the church that supported them. The French Revolution started with raged filled mobs attacking everything royal and representative of wealth and power. Nothing was sacred, and no one was exempt from their wrath. Once they became organized, they erected a guillotine to rid themselves of those they saw as in the way. Tens of thousands were beheaded, many guilty of nothing more than speaking their mind or being at the wrong place at the wrong time. They called the committee in charge the “Committee for Public Safety” and their motto was “Liberty, Equality, Fraternity, or Death”. 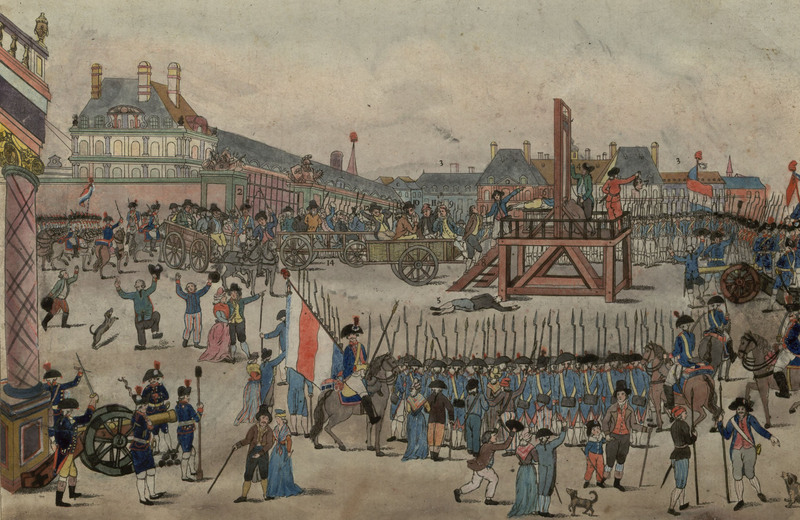 This French Revolutionary period is also aptly called the Reign of Terror, and ended when the head of the committee, Robespierre, was himself beheaded. A new French Republic was then born, and with it the seeds for a new dictatorship were sown. The fact is, the French Revolution sought to create a society that only existed in the minds of philosophers and fools. The tribal myth they based many of their ideas on could only exist within the confines of a few closely connected families, and was woefully inadequate to manage a large society. The ideas of the French Revolution unfortunately did not die on the guillotine, but lived on, forming the basis of new philosophies and new governments. Socialism, Communism, Fascism and many parts of Progressivism have roots in the French Revolution. The blood, that ran so freely in Paris during the Reign of Terror, was exponentially multiplied by all but one of these sons of the French Revolution. Today the term death may no longer be part of the motto that sprang to life during the French Revolution, (it was omitted by most of its followers shortly after the Committee for Public Safety was disbanded) but the philosophy that drove the mobs is alive and well. Its spirit can be seen in the violent street protests in Greece and other parts of Europe and even in the Occupy Wall Street and Black Lives Matter protesters in America. The philosophies of the two revolutions have shaped and directed the world for both good and ill. One built on experience and reality, and the other built on lofty ideas and utopian fantasy. Where the American Revolution sought to allow an atmosphere where all could have a chance to live life as fully as their talents would allow, the French Revolution sought economic parity and brotherhood. Although the American Revolution was by no means guaranteed success, the French Revolution was damned from the start. Envy of the upper class fueled the fires of the French Revolution, a revolution of philosophically justified rage. Where the streets of America flowed with the blood of patriots fighting for freedom the French streets flowed with the blood of innocent men women and children. Those countries that embraced the ideas of the American Revolution led the world in prosperity and innovation. Those countries who choose to ignore the principles of individualism and capitalism, but instead embraced the societal based philosophies of the French Revolution, found themselves excelling only in poverty, disease, and revolutions. Sorry for the elongated delay, was traveling internationally and did not have a lot of time to check on the blog. It is hard to respond in depth, as the subject could take an immense amount of space. To skim the subject, the Philosophe movement formed the basis of many modern leftest beliefs. The movement itself grew out of Rene Descartes belief that reason alone could be used in all human endeavors to discover the best course of action. Of course, reason is a tool, but it depends on having all the facts needed to predict an outcome, human endeavors are never that cut and dry. Rousseau and many of his compatriots embraced this idea. Combining it with cellular science (new at the time), they reasoned society was like a body, with individuals being the cells, society being the body, and government being the intellect directing it all. It is not hard to see that fascism developed out of progressivism. In fact Mussolini said he modeled his government on war time administration of Woodrow Wilson, his idol. Modern progressivism is an evolved version of what it was in the twentieth century. It still wishes to control the world, and sees itself as good even as it does evil. I love the article, it really cleared up some of the questions I had regarding the influence on Revolution had on the other. However, I still have one question: May I know the name of the author? Thank you, I would love to share my identity, but unfortunately my work within a federal agency precludes it. So like you, I prefer to maintain some anonymity. I only ask because I am doing research and I would like to get the names of authors of articles. No problem though, I respect it. Please feel free to reference the web site. Later, when in a less politically sensitive position, my name will be added to the sites info.